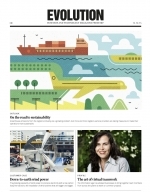 Gaining insight and information from rolling bearing damage and failures is of strategic importance for SKF and its customers. 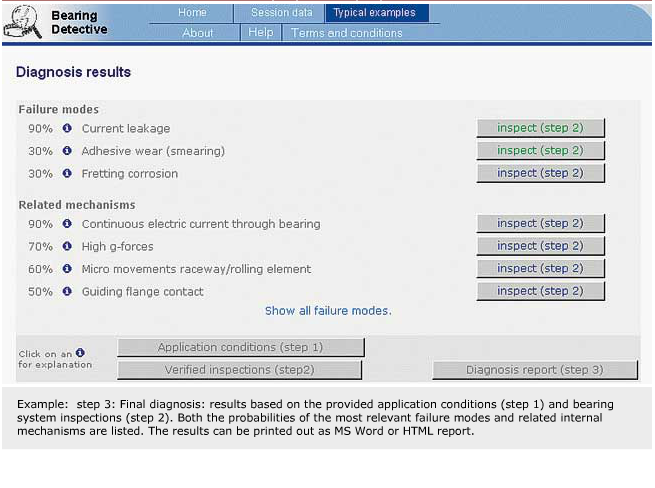 The knowledge collected on bearing damage is accessible for SKF engineers as a web-enabled decision-support system called BearingDetective.The decision-support system BearingDetective is aimed at offering increased speed, consistency and higher quality in the bearing decision-making process. It should help to prevent bearing damage or failure from reoccurring. 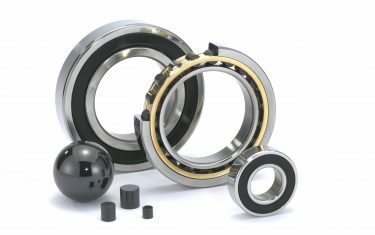 As with any knowledge-based computer system, BearingDetective gathers all the relevant information and experience available about rolling bearing damage – from basic principles to practical engineering results. Current knowledge-based systems have benefited from the experience of expert systems developed in the 1980s, although these suffered major flaws in aspects of reasoning capacity and computer power. These systems were often structured as decision trees that led from symptoms to possible causes. Causal relations between symptoms and possible reasons do not exist in reality and can easily lead to wrong conclusions. This is simply because the reasons (e.g., wrong bearing mounting) result in the damage symptoms (e.g., fretting signs), and not the other way around. A modeling of a relationship from causes to symptoms where uncertainty is attached to “possible failure states” fits much better with the physical phenomena that occur during bearing service life. With the aid of state-of-the-art computational intelligence techniques, this approach has been followed for the development of the BearingDetective. Cases: Many bearing failure experiences can be found in case examples. Unfortunately, many practical cases are not well documented, and no uniformity regarding the documented parameters or failure mode conclusions exists. Example cases can, however, be used to model or verify other knowledge representations. Rules: It is possible to generalize if-then rules between observed symptoms and possible causes. However, this is not appropriate because different causes can have similar effects that appear as similar symptoms. Artificial Neural Networks: Mathematical relationships between symptoms and causes can be derived by using example failure cases. However, there are not sufficient number of discriminating cases to do this. Furthermore, system users require additional explanations rather than “black box” artificial neural network relationships that do not carry such explanations. Probabilistic Networks: It is possible to derive visual networks in which nodes are connected by causal relationships, based on bearing failure theory and experience. Furthermore, probabilities are assigned indicating the weakness or strength of those relationships. By introducing correct causality from conditions to observations, this knowledge representation best fits the bearing failure diagnosis problem. Analysis of bearing damage and failure is principally a diagnostic task. Imagine a patient visiting his doctor with a specific complaint. The doctor first questions the patient about specific body and life-style parameters such as weight, smoking, etc. (conditions). Based on that, the doctor makes hypotheses about likely diseases (failure modes). The doctor verifies or rejects these hypotheses through further questioning and inspection of the patient (symptoms). Verifying or rejecting hypotheses. 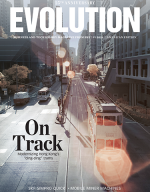 One by one, the generated hypotheses are investigated and verified or rejected. For example, the doctor starts investigating the most probable diseases by conducting specific medical tests (blood pressure, heart rate, etc.). With a probabilistic network, the two-step reasoning is implemented by forward and backward probability calculations. The probabilistic network is a visual network in which nodes are connected by causal relationships, and probability calculations are applied. 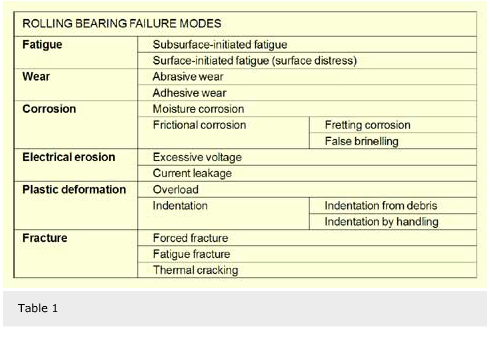 The network for bearing failure analysis has four node categories: conditions, internal mechanisms, failure modes and observed symptoms. Conditions represent the conditions from and under which the bearing operates. Examples are speeds, bearing type, load, temperature, installation details, environmental factors, etc. Internal mechanisms represent the physical phenomena that happen during operation, such as lubrication, film disruption, sliding contact, etc. 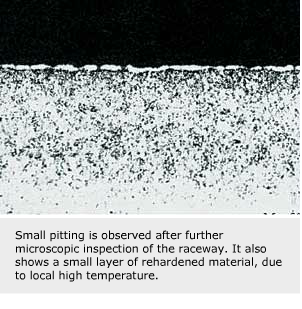 Failure modes represent the types of failure, such as subsurface-initiated fatigue and fretting corrosion. 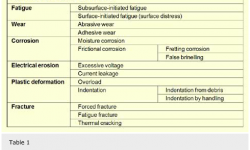 In table 1, the various failure modes are listed. Observed symptoms represent the observable phenomena inside and outside the bearing, including discoloration, spalling, rust, etc. About 150 nodes are connected by causal relations between conditions of the bearing application, hidden mechanisms, (physical) failure modes and observed symptoms. In the modeling of the network, various sources of information were used. Apart from defining the nodes, the causal relations and probabilities, explanation texts (for each node) including examples and pictures are developed. In total, about 250 pictures have been included in the system. In the system’s user interface, the user can state that acceleration is true. This will change the above probabilities into 1.0 and 0.0, respectively. In the network, conditional probability tables are defined (table 2). In this way, all the probabilities of the nodes are calculated, given the prior probabilities of the start nodes. By considering the application conditions as the start nodes, the probabilities of the failure modes can be determined and ranked. This is the failure hypotheses generation. Notice that uncertainties are attached to the node states rather than to if-then rules in a classical expert system. Verification or rejection by inversion: After hypotheses are generated, we have to verify or reject them by investigating the bearing. This ranges from visual inspection of the bearing to simple or complex laboratory tests. For this purpose, one first has to explain how probabilities of observations will influence the probabilities of the failure hypotheses. This states that the belief in hypothesis B obtaining evidence C can be computed by multiplying our previous belief P(B) by the conditional probability P(C|B) and that C is true if B is true. The conditional probabilities P(C|B) are modeled in the network as causal relation, P(B) comes from forward reasoning (step 1), and P(C) are set during the bearing investigations. These are the observations that serve as evidence for the failure hypotheses. P(B|C) is called the posterior probability, while P(B) is the prior probability. Instead of investigating all possible observations and non-filled-in conditions, the most relevant ones are suggested, dependent upon the failure hypothesis (or internal mechanisms) that need to be investigated. In other words, these are the application conditions or observations that have the most discriminating effect on the failure hypothesis. The discriminating effect is determined by a mathematical measure. For all possible not-filled-in conditions or observations, this measure is scaled between 0 and 100. An example is given in the illustrations. Eventually, by investigating the application conditions and observations, the likelihood of the failure hypotheses and internal mechanisms are determined and ranked. These then form the conclusions of the bearing damage analysis. The system is further extended with various functions that can help the user. A simple file with user instructions is provided for getting started. The system offers translation of key terms into English, German, French and Swedish. Session data control is available for session data storage and retrieval. Also, through a file marked “Typical Examples,” users can be guided through the application of the program. 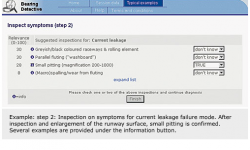 For convenience, an extensive report can be generated in MS Word or HTML format, including the relevant conditions, observations and failure mode probabilities. 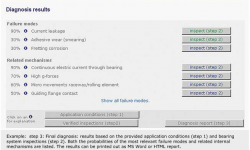 The BearingDetective contains several common bearing damage cases located under “Typical Cases.” These can be used as training material to demonstrate how the BearingDetective supports the analysis of a bearing damage investigation. 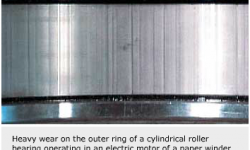 One example is of an electric motor in a paper mill. 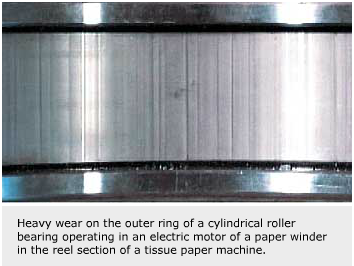 In this case, an electrically insulated cylindrical roller bearing NU 322 ECM/C3VL024 is used in an electric motor of a paper winder in the reel section of a tissue paper machine. The electric motor speed is variable (400 VAC with frequency converter) and running between 1000 and 1500 min-1. After only a month of operation however, heavy wear was observed on the inner and outer rings. 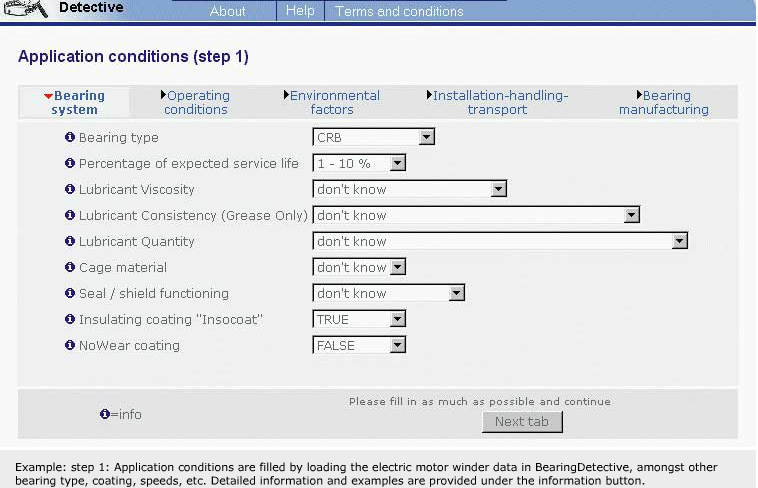 Loading the example case in BearingDetective sets all known application conditions (step 1). 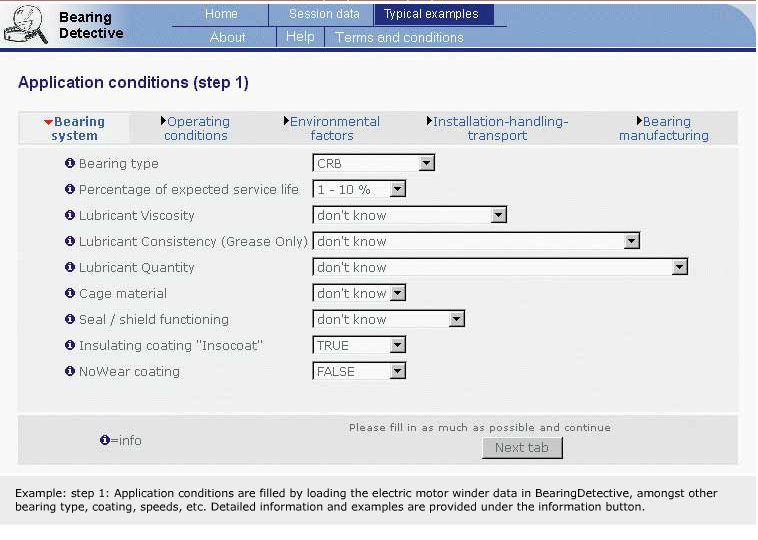 The first hypothesis of possible failure modes is calculated based on these application conditions. At this point in the analysis, BearingDetective gives a high likelihood of false brinelling, adhesive wear and current leakage. At first sight current leakage and false brinelling seem unlikely because the machine uses insulated bearings and all machines are properly supported with rubber pads. 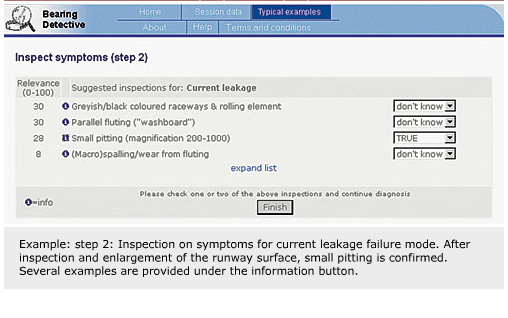 The user then has to perform the second step of the analysis by inspecting the bearing on failure symptoms. Clicking “inspect” results in a list of damage symptoms most relevant to the selected failure mode. The bearing is first inspected for false brinelling. Because no shallow depressions are found that can verify false brinelling, this failure mode is rejected. The analysis is continued with inspecting of symptoms of adhesive wear. None of the symptoms related to adhesive wear are found either. 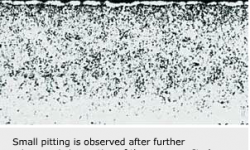 Finally, by inspecting electrical current leakage symptoms, the presence of small pitting is found after magnification of the raceway surface. This verified the current leakage failure mode. Subsequently, the customer indeed discovered an earthing problem in the winder construction causing the electrical current leakage. 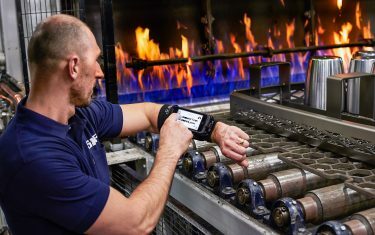 BearingDetective meets the need for a fast, more consistent, high-quality decision-making process for bearing damage and failure investigations. 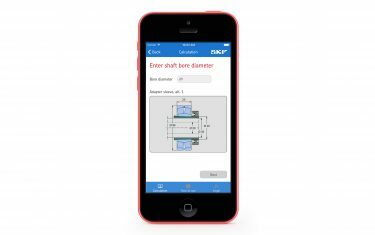 This web-enabled system is available for SKF engineers to support customers in bearing damage and failure investigations.